December 27th, 2017: Tehran is cold — winter is coming, and Iran is getting ready to embrace it. 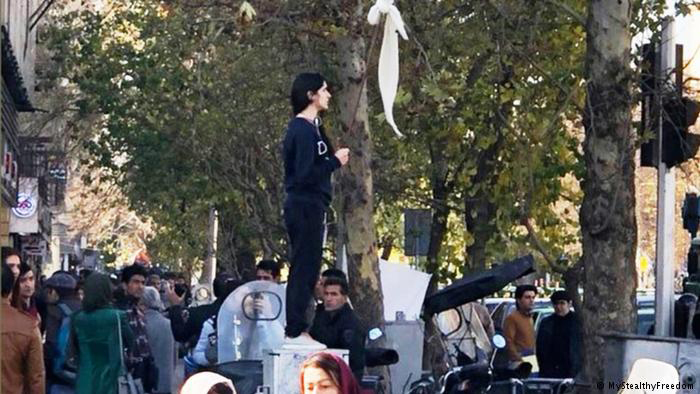 Revolution Street (خیابان انقلاب), one of the oldest and busiest streets in the heart of the city, is witnessing a young Iranian woman standing on top of a utility box on the sidewalk. Her white headscarf, which was supposed to cover her hair in public, is on a stick in her hands. She is waving it like a flag without saying a single word. 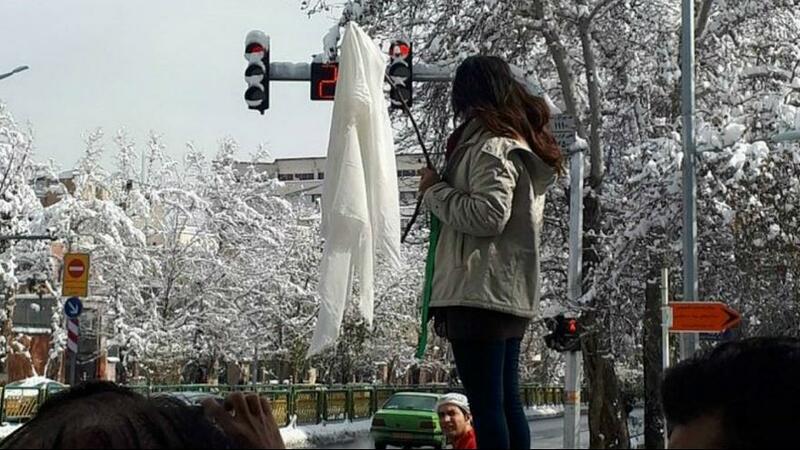 This unprecedented way of protesting compulsory hijab drew attention from all over the country, and since not everyone knew the girl’s name at that time, she became known as “The girl of Revolution Street.” Her name is Vida Movahed. She got detained for acting against the Islamic law, but she was released less than a month later under the pressure of people, who were asking about her and seeking her freedom. January 29th, 2018: winter has come, and snow is gently sewing the sky to the streets of Tehran. Now, “The girl of Revolution Street” is not referring to just one girl anymore. 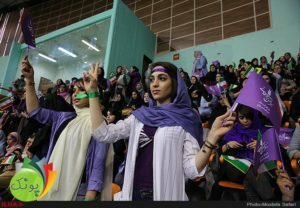 Vida’s act of peaceful civil disobedience enthused dozens of Iranian women across the country to protest in the same way. 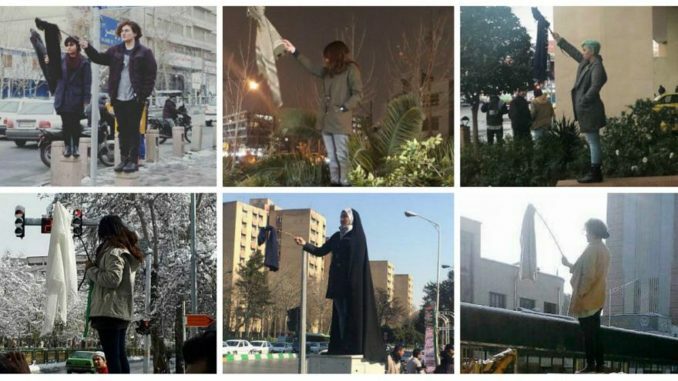 Regardless of their religious beliefs, with and without hijab, they are standing up in public and holding a stick with a headscarf on top of it. Unafraid of getting arrested, young and old are making the same symbolic gesture to wordlessly say their message. Their message is clear: women should have the right to choose how to dress. The “girl” duplicated to “girls,” and as the images of them flashed through social media, “The girls of Revolution Street” was a trending hashtag on Twitter. In 1936, Reza Shah, the founder of the first Pahlavi dynasty, banned the hijab as an act of modernization. This made lots of Iranian women of the older generation reluctant to leave their houses since they could not wear their desired dress and were not allowed to cover their hair in public places. The situation changed under the rule of the second king of Pahlavi dynasty in 1946, Mohammad Reza Shah. As a more educated and modern ruler, he allowed women to choose their dress in public. His monarchy lasted for more than 36 years before the Islamic Revolution in 1979 caused by the government’s corruption and the Shah’s failure to address people’s democratic demands. A year after the Islamic Revolution, wearing headscarves became obligatory for women in public places — an autocratic law against the revolution’s original visions of freedom and equality for all individuals of the society, regardless of gender, class, ethnicity, and religion. 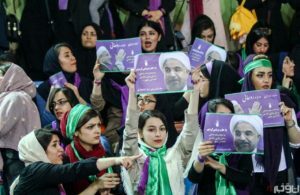 The recent act of peaceful civil disobedience by Iranian people have brought up a broad political debate between the reformist, moderate groups and the hardliner Islamic clerics about the essence and the core of the Islamic Revolution. As the current official name of the country is the Islamic Republic of Iran, the question is which one should come first? Republic and the right of people to decide about their lifestyle and way of living, or the traditional perception of Islam which allow Islamic rulers to dictate their view of Islam to people.